1All homophyllous unless otherwise noted. 3The name Pinguicula chuquisacensis also applies to this species. See my notes below. A: Here we enter an area where we know surprisingly little about Pinguicula. Many of these species are endemic to Cuba, and as such are difficult for botanists to visit because of a raft of permits required. USA botanists are essentially prohibited from doing science in Cuba because of USA laws that are truly bizarre and inconsistent with reality. In any event, many of these species are highly localized in range, and are probably very endangered. They would be very interesting to learn more about. Subgenus Isoloba section Agnata was absorbed into subgenus Temnoceras section Temnoceras. Furthermore, several species were lost, as P. caryophyllacea is absorbed into P. benedicta, P. lippoldii and P. toldensis are absorbed into P. bissei, and P. lithophytica is absorbed into P. jaraguana. Subgenus Isoloba section Isoloba as represented in this region is unchanged. Subgenus Temnoceras section Ampullipalatum was moved to subgenus Isoloba section Ampullipalatum, and it lost P. elongata to its own section. Subgenus Temnoceras section Heterophylliformis from Casper, which was not used by all botanists, is reformed with P. elongata. Despite this plant's name, it does not occur in the continent of Antarctica. I really shouldn't have to say this, but this plant's name has inspired at least one internet April Fool's joke, and has confused a number of young acolytes just starting to study the genus. Although it may in fact be the carnivorous plant with the most southerly range, it certainly does not grow on the continent of Antarctica. The beast previously known as P. chilensis Clos was found to have some technical problems with how it was named, so this name was established to replace it. Evidence appears to be mounting that would result in a merger of this species with P. bissei. Evidence appears to be mounting that would result in a merger of this species with P. bissei. A very striking plant with erect, elongate leaves. I wonder if it possibly captures prey using a hybrid foraging strategy, similar to the pitfall-sticky trap method used by Drosophyllum. Is it possible it uses its short, early-season leaves to make a bowl-shaped chamber, almost like that of a pitcher plant? A shortlived species that has long, delicate, threadlike leaves. I have been unsuccessful at propagating this vegetatively or via selfing, which means that every time I have grown this, I enjoyed it for about 2 years and then it died. A white flowered variant (P. filifolia subsp. alba Y. Domínguez, Panfet & V.Miranda) has been named. somewhat surprisingly at the subspecific rank. This species has not been seen since it was first discovered, in 1968, at two sites. Its distinctness, or affinities to other species, is highly uncertain. This species is retained with a complete description of the plant, although Roccia et al. (2016) forgot to include this species in their table of species counts, on page 65 of their work. A delicate Cuban species that, like P. casabitoana, is a true epiphyte and lives on the vertical surfaces of trees (including Pinus sp.) and shrubs. Reported from the Andes, with small flowers but relatively large leaves. 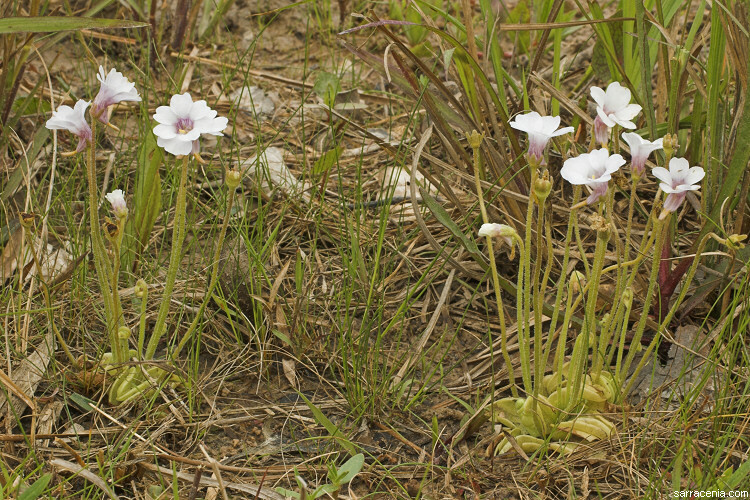 The species, along with Pinguicula involuta, produces stolons or runners. The specimens used to describe this plant were actually illegally collected from the wild without permission, and the description was published electronically. 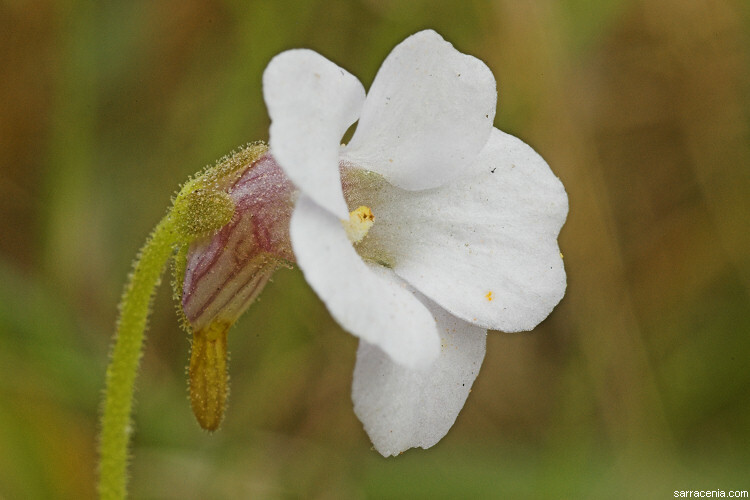 A few weeks later, "Pinguicula chuquisacensis" was described in print, based upon legally collected material. However, the name P. jarmilae has been accepted as having publication priority. Apparently, sometimes, it pays to break the rules. Hmm. This is the only species mentioned on this page that strays out of the Caribbean or South America. It occurs on mainland USA, all the way up to North Carolina. Page citations: Beck, S.G. et al. 2008; Casper, J. 1966, 1987, 2007; Gluch, O. 2017; Halda, J.J. et al. 2007; Lampard, S. et al. 2016; Panfet-Valdés & Temple 2008; Rice, B. 2006a; Roccia, A. et al. 2016; Schlauer, J. 2002.